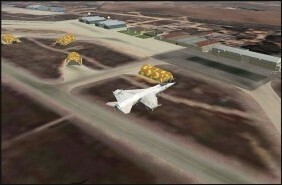 So you've downloaded a couple Mirage aircraft and they look pretty good. But they look a little out of place sitting on the ramp at a civilian airport. 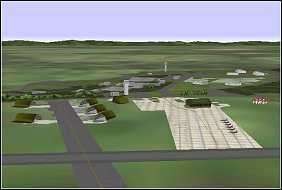 There are military airbases included in the default Flight Simulator scenery. 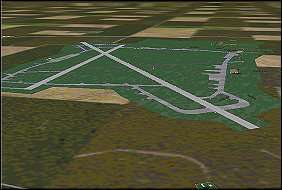 But as with many included airports they are a little sparse in the area of buildings, taxiways, etc. It is very common for NATO and other military units to cross train and/or participate in each other's air shows. This means flying to one or the other's base of operations. So I've collected several air bases of other European nations below with an emphasis on those operationg the Mirage. Notes: Designed for FS2004. Included in Belgian Alpha Jets Package along with Cazaux AB (LFBC) in France. Notes: Designed for FS2004. Part of a package of three Belgium airbases. Toss out the F-16 textures. Requires some previous MAIW installs -- see the readme file. Notes: The Belgium Air Force flight training center. 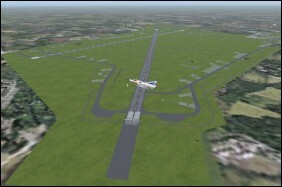 Designed for FS2004. This scenery no longer is available. 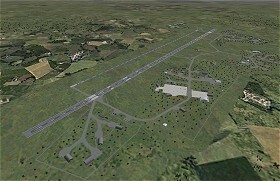 Notes: Designed for FSX. Home of the 10 Fighter-Bomber Wing. Notes: Located about 60 miles northeast of Brussels, Belgium. Home of the 10th Tactical Wing (F-16). Designed for FS98. 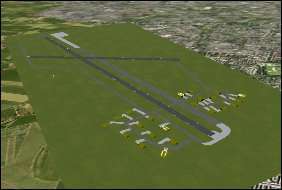 Updated for FS2000 - EBBL20.ZIP (479KB). Notes: Operated by the U.S. Air Force. 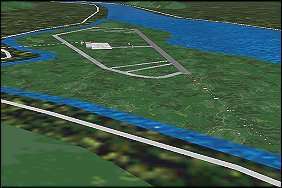 The base is located about 60 miles Southwest of Brussels, Belgium. Designed for FS2000. Notes: Koksijde Air Base hosts the Belgian Air Force's Search And Rescue operations over the Channel and the North Sea. Notes: Designed for FS98. For startic aircraft you'll need the fixit file, KOKSABFX.ZIP (59KB). 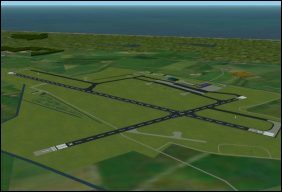 Updated for FS2000 - EBFN.ZIP (270KB). For updates visit the designer's website. 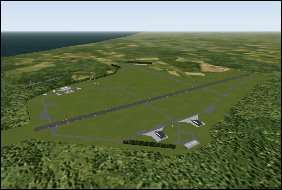 Notes: RAF base/civilian airport located on the North Cornish coast. Designed for FS2002. 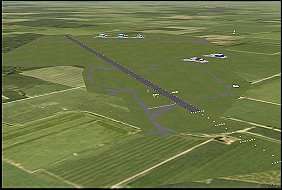 Notes: This file replaces the default Leuchars AB in FS2000. 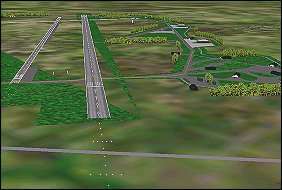 This file contains both HAS complexes, ILS, Nav aids, all Taxiways and Runways. Designed for FS2000. Notes: A large military base located on the coast of Scotland, Great Britain. 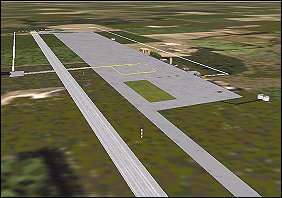 This scenery includes all hangars, HAS, taxiways and runways plus lots of static scenery. Designed for FS98. Notes: Located about 60 miles from London Heathrow and hosts the annual "Royal International Air Tattoo". The airport has some static military aircraft (including Concorde), hangars, public grandstands and extra scenery. Designed for FS98. Notes: Six airports in southwest Netherlands including Gilze-Rijen (EHGR) and Woensdrecht (EHWO) Air Bases. Designed for FS98. 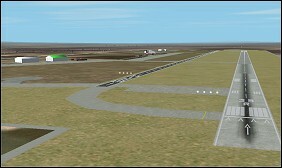 Notes: A detailed yet very framerate friendly scenery for the Leeuwarden Airbase, also known as "Fightertown Europe". Requires Gerrish Gray’s trees_v3.zip. Designed for FS2002/2004. Notes: Leeuwarden is the 'Fighter Town' of European NATO forces. 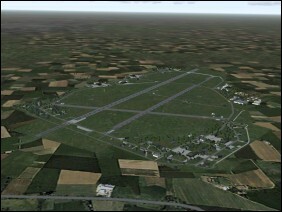 Notes: Accurate and detailed scenery of Dutch Naval Air Station (vliegkamp) Valkenburg. Located close to the capitol Den Haag. Includes all navaids and charts. Designed for FS2002. 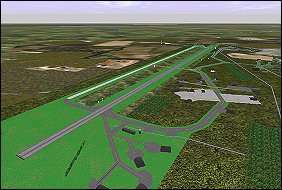 Notes: Kramfors is the closest airfield to the city of Kramfors. 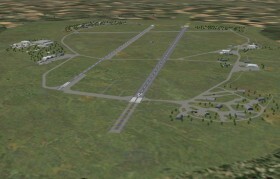 It is a medium size airport used for domestic and military flights. Designed for FS98. Notes: Ramstein is the biggest U.S. Air Force Base outside the USA. Scenery with static aircraft. Requires Airport 2.0x textures. Designed for FSFW95/FS98. Notes: Located in the northeast corner of Germany, Neubrandenburg is a joint military/civilian airodrome with static and dynamic objects. Designed for FSFW95/FS98. Notes: For FS2002/FS2004. 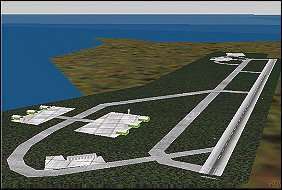 AFCAD overlays for joint military/civilian base located on Canary Islands. Home of 462 Sqn (Mirage F1EE) of Ejército del Aire. 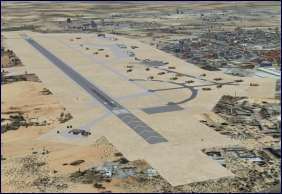 Notes: Akrotiri Air Force Base is the main airport close to Akrotiri, Cyprus. 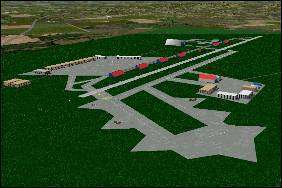 It is a medium size airport used for regional, military and international flights. Designed for FS98. 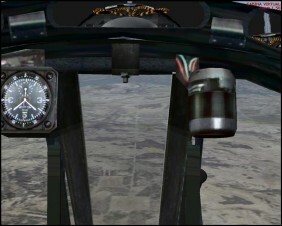 Notes: Designed for FSX. 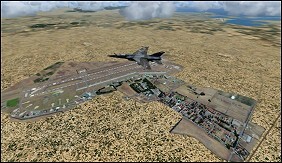 Includes several MAIW aircraft models and photorealistic ground cover for nearby city of Albacete. 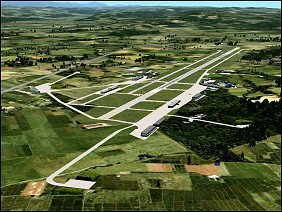 Notes: Designed for FS2004 (image from FSX). Included in AI package by Nick Black. Notes: Designed for FS2004 with photorrealistic ground textures (Manuel Marín Carrión). Military ground service objects by John Stinstrom. Autogen by Diego Novillo. Notes: Scenery for Los Llanos Air Base (LEAB), near Albacete in southwest Spain. 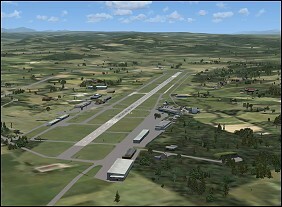 FS98/2000 version (91KB) Updated for FS2002 with new textures, details, static aircraft and AFCAD file. Separate AFCAD file available. 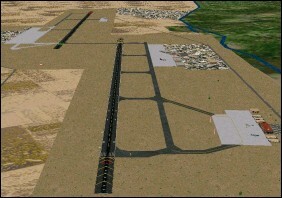 Both versions require Airport textures. AFCAD requires AFInstaller. Notes: Scenery for Los Llanos Air Base. Designed for FS98/2000 using Abacus ASD. Limited detail but adds Navaids. Includes navigation charts. Requires AFD Textures files. 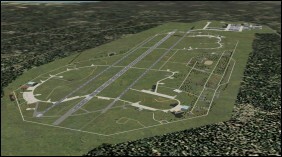 Notes: A medium size military/civil airport used for regional and domestic flights. Designed for FS98. Notes: A joint USAF/Ejercito del Aire airbase. Designed for FS2000. 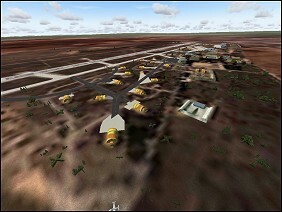 Notes: Very detailed scenery of this important (but non-Mirage) airbase made for Ala12 Virtual group. 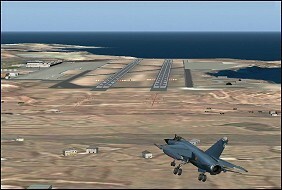 Both FS9 and FSX versions available. Several updates since original release. Notes: This is the scenery of the Torrejon AFB located near Madrid. The buildings and objects are accurately placed. Includes static aircraft. Designed for FS98. Notes: Scenery for Torrejon AFB near Madrid. 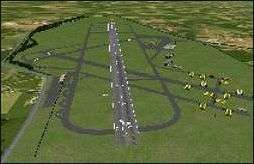 Details such as runway, control tower, taxiways and apron are accurately located. Designed for FS98. Notes: FSX scenery. 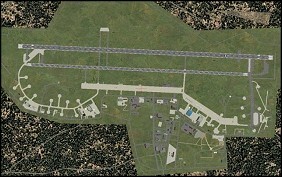 Joint civilian/military airport. See the readme file for necessary library items not included. Photoscenery base layer also available. Notes: FS2004 scenery made in Gmax, no frame affection. Only military areas. 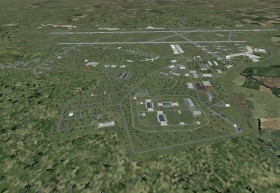 Includes photo-realistic textures, AFCAD, representative buildings. 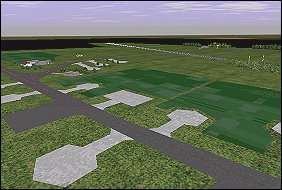 Readme file suggests also installing FS2004 Scenery Military Ground Service Vehicles by John Stinstrom. Notes: For FS98. 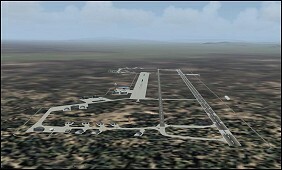 Detailed scenery includes airport with all navaids, all buildings, and static aircraft. Notes: FS2004 scenery made in Gmax, no frame affection. Firing Range of Bardenas Reales, in Navarra, Spain. Near Zaragoza AFB. 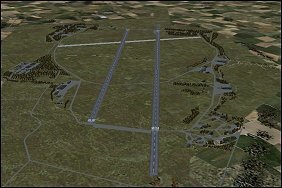 Notes: Versions for FS2004 and FSX. Aircraft texture and scenery package. 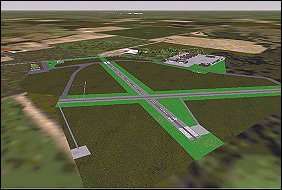 Includes Afcad with runways, taxiways, and parking. See the readme file and visit the MAIW forum thread. Notes: For FS2004. Requires MAIW Greek F-4 package for buildings. See MAIW forum for complete list of needed scenery objects. 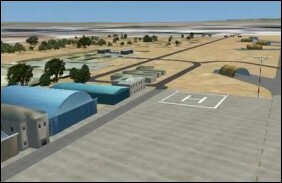 FSX Files: Kasteli Air Base (LGTL), Chania (Souda Air Base) Crete (LGSA), and Araxos Air Base(LGRX). 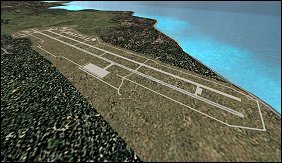 FS2004 Files: Dekeleia Air Base (LGTT), Araxos Air Base (LGRX), and Limnos (LGLM). Notes: Scenery for military air bases and joint military/civilian air fields in Greece. 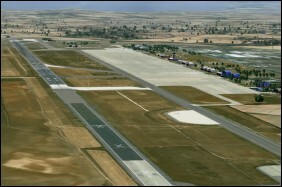 Notes: AFCAD files for Hellenic Air Force airports. Includes: LGAD, LGAG, LGBL, LGEL, LGKL, LGPZ, LGRX, LGSY, and LGTG. Notes: FSX/Acceleration and P3D. 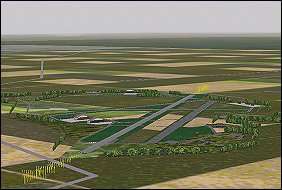 Photo-realistic base with accurate AFCD and airfield buildings. Notes: For FS2004. Created with ADE9. See readme file for list of MAIW library objects required. Notes: For FS2004. Replaces default scenery with new AFCAD and AI traffic. Notes: For FS2002. 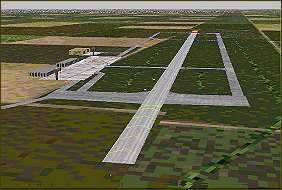 Replaces default scenery with taxiways, ramp for visiting NATO fighters and cargo aircraft. Includes TACAN and NDB. 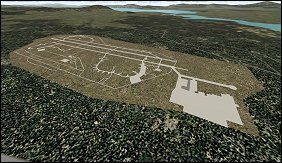 Notes: Versions for FS2004 and FSX. Designed for use with Switzerland Professional scenery. Notes: Home of Escadrille 10, Reconnaissance (Mirage IIIRS). Designed for FSX SP1, SP2 and Acceleration. Notes: Be sure to read the readme file for additional suggestions and requirements. 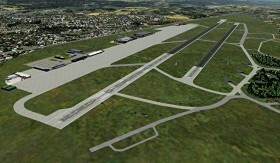 Notes: Swiss Air Force Base Payerne, home of Escadrille 10, Reconnaissance (Mirage IIIRS). Included in SWISBASE.ZIP above. Designed for FSFW95. 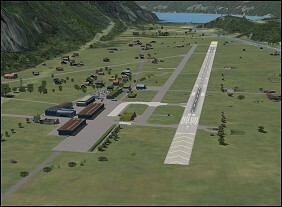 Notes: Scenery and static aircraft for twelve Swiss Air Force Bases. Designed for FSFW95/FS98.